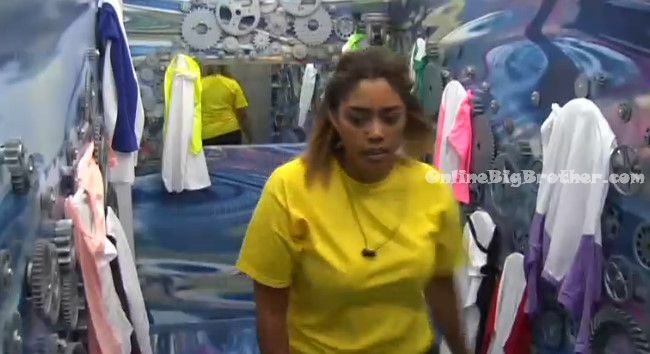 Big Brother Canada 3 - Easter Monday Challenge "Who thought laundry would be this hard!" POV Holder: Johnny Next POV ? 1pm – 2:pm Big Brother blocks the feeds. When the live feeds return – Big Brother blocks the live feeds for the house guests to compete in a special Easter Monday competition. They’re all running around the house collecting their coloured shirts which are scattered around the entire house. Once they find them they have to run out to the backyard and hang them on the hangers. The first one to collect all their coloured shirts is the winner. Jordan says who thought laundry would be this hard?! All the girls are wearing yellow and the guys are wearing blue shirts. 3:10pm Godfrey thinks he has collected all his shirts first and slams the red button. Bobby tells Godfrey he hit the button too hard! 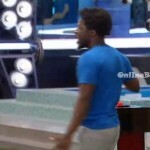 (Looks like he broke the button) Big Brother tells them all to stop as they confirm if he has won or not. Bobby says God you’re missing one! Big Brother blocks the feeds. I love these fun little challenges! I wish I could be there doing this! I’m watching the live feed,Zach is talking to Ash as if he is the godfather.we take out such and such, we are in a good position…… blah blah blah power trip. I so over him gosh. Bruno wake up and get rid of him. Glad to see Willow be sympathetic to Godfrey, I actually like Godfrey take him away from Graig and Bobby and he’s really not that bad just a bit of a dimwitted player. Zach asks if the live feeds can see in the havenot room? Jordan asks did she give you s*xu@l favors?